There’s too much “old” in the Old West of Red Wolf #1. 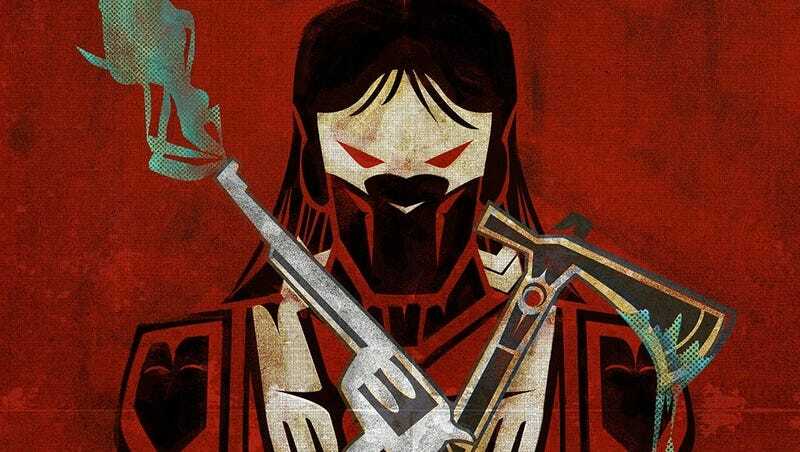 The newest version of Red Wolf, the indigenous superhero that Marvel Comics introduced in the ‘70s, first appeared in 1872, a minseries tying into Marvel’s ongoing Secret Wars crossover. In that title’s alternate reality, time-shifted versions of Steve Rogers, Tony Stark and Bruce Banner came into conflict with a robber baron iteration of Wilson Fisk who ruled over the frontier town of Timely. In 1872, Red Wolf assumed the role of sheriff after the murder of Steve Rogers and the fun came from seeing established characters done up with period-appropriate re-imaginings, like the steampunk-ish Iron Man locomotive armor invented by a whiskey-drenched Stark. Red Wolf was quickly established the main character there and his ascendance pulled energy from the drama around all the other conflicts. Red Wolf rose as other would-be heroes faltered in 1872. However, his new solo series—by writer Nathan Edmondson with art by Dalibor Talajic, Jose Marzan, Jr., Miroslav Mrva and Cory Petit—suffers from a lack of that melodramatic backdrop. He’s still the sheriff of Timely but one whose authority gets challenged immediately. Part of what bothers me about Red Wolf #1 is that the dramatic friction in this first chapter comes almost entirely pitting him against Timely’s white settlers. While it’s a familiar convention in Western stories, something about the execution here grated on me. It makes story-sense that some of the caucasians of Timely wouldn’t trust Red Wolf but that’s the blandest possible way to add spice to this story. The last major series with a Native lead was Jason Aaron and R.M. Guera’s Scalped, published by DC Comics’ Vertigo imprint. The crime-drama plotlines in that book mined drama by simply having its Native characters clash against each other in ways that showed them struggling to uphold tradition in the modern day. Red Wolf #1 makes light of white people dropping the names of indigenous tribal groups in wrongheaded fashion. It’s a sly bit of humor but the book doesn’t show Red’s connection—or even lack thereof—with his own people. I went into this comic hoping for a sharper, more subversive take on these kinds of tropes and wound up with what felt like a lot of the same old thing. Where Red Wolf #1 succeeds is in evoking its lead character’s sense of communion with its setting. A sequence where Red tells a young townsperson to keep watch makes it feel like he really is an expert tracker. And an exchange with Red’s mother also carries the subtext of the harshness of frontier life, when she mentions that the day hasn’t yet come that she won’t be able to do her own hunting. The main antagonist of the book shows up late in Red Wolf #1, triggering a drastic turn of events that will challenge Red Wolf’s abilities to keep anyone in Timely safe. It’s a callback to previous iterations of the character, who went on adventures with the Avengers and other A-list Marvel characters. It’s too soon to say if this re-invention of the character will do the same but I do hope that Red Wolf does more than retread plot points from several decades’ worth of cowboy movies.